Jacqueline Yonover is a Global Studies major at the University of Illinois at Urbana-Champaign. She composed this blog entry in the ‘Language and Minorities in Europe’ (GER 418) course in the spring of 2013. The Catalan language is a Romance language that is has been characterized by many years of conflict related to issues of identity among the Catalonian people (Gruyter, 2008). It is language that has always maintained linguistic, cultural, and economic differences compared to that of the rest of Spain (Cos Pujolar, 2006). The origins of Catalonia’s contemporary linguistic controversy can be traced back to the dynastic developments, which began with the marriage of Ferdinand of Aragon and Isabella of Castile and furthermore the unification of Spain in 1469 (Gruyter, 2008). The state of the Catalan language has changed continuously since the 1400’s—experiencing periods of dominance and also years of serious persecution (Derhemi’s Class Lecture Notes, Spring 2013). The conflict of identity among the Catalonian people is directly related to the 40 years of persecution that the language experienced during the rule of dictator Francisco Franco. Under Franco’s dictatorship the Catalan language was forbidden in all aspects of life, but managed to survive because the language was used among families and friends in private life situations. Since the end of Franco’s dictatorship in 1975 the Catalan language has experienced profound changes in regards to defining elements of nationality, which has created this identity conflict among those living in Catalonia. There are two sides to the Catalonian identity conflict. Some Catalonian’s feel that their identity still is not represented fairly. These individuals view those who do not support the protection of the Catalan language as “Españolistas” (pro-Spain, rather than pro-Catalonia) who continue to hold onto the ideals instilled in their minds during the dictatorship of Franco (Balsells, 2011). The individuals who are not entirely supportive of the Catalan language are not necessarily against Catalan but feel that, because there is so much emphasis on the Catalan language in Catalonia, the importance of the Castilian language is being overlooked. In the remainder of this blogpost I plan to explore this identity conflict in further detail. I will do so by first looking at the current status of the language. I will then explore various different opinions of Catalonians regarding this identity conflict. Finally, I will conclude this discussion with some final thoughts. All together this blogpost will exhibit how relevant and important this issue is today and it will also show us how much of an impact this conflict has had and continues to have on the lives of individuals living in Spain today. Today Catalan enjoys the status as an official language in Catalonia, along side Castilian (Spanish) and is spoken by 13 million people throughout the region of Spain (Vila i Moreno, 2008). This current status, however, was not achieved without a fight. A “fight” that still exists today and can even be felt by those who do not take part in this identity conflict among Catalonians, which takes many forms. It is important to note that Catalan did not gain its current status as an official language until 1994, when the Supreme Court recognized two official languages in Cataluña (Reese, 1996). At this time, the Supreme Court ruled in favor of various articles of the Linguistic Normalization Law (Reese, 1996). These changes can be linked to much of the current identity conflict, which we will look at next. As the status of Catalan began to change with the implementation of new laws after the end of the dictatorship of Franco, the identity conflict among Catalonians became very apparent. For example, in November of 1994 Jordi Cruyff, the son of a Barcelona Football Club coach and a soccer player on the Netherlands team, who also holds dual nationality in Spain and the Netherlands was interviewed and asked the following question, “ Do you feel more Dutch or Spanish?” He responded by saying, “Español no. Barcelona esta en Catalonia y no queremos ser españoles/ Spanish no. Barcelona is in Catalonia and we do not want to be Spanish” (Rees, 1996). We can see from this example how this conflict has expanded beyond just being a language conflict and into the realm of individual identity become a conflict of language and identity. Not only do many individuals from Catalonia feel that their identity should be recognized as different from the rest of Spain but they feel that Catalonia’s linguistic diversity should be recognized as well in the currency that is used in Catalonia. Reese explains that there are groups of individuals in Catalonia that believe the national currency in Spain does not reflect the linguistic diversity that exists within the country because the currency used in Catalonia and in the rest of Spain is only printed in Castilian (Rees, 1996). Some of those who take up the other side of the identity conflict among Catalonians do not fully support many of the laws, which have been implemented in Catalonia aimed at protecting the Catalan language. Especially those laws regarding education. For example, one mother of a grade-schooler in Catalonia felt that her child should receive more classes in Castilian. This mother explains, "I am not against Catalan; I want her to learn it and speak it correctly, but I think it is totally exaggerated to leave out Spanish (Balsells, 2011). However, the law today in Catalonia states that, “Students may choose the language of education in the first years of schooling, but from the age of 8 the “vehicular language” of the regions education system is Catalan” (Balsells, 2011). This mother further expressed her opinion regarding Catalonia’s law regarding education by saying, “This is a clear inequality and they don’t give you any alternatives” (Balsells, 2011). Individuals who have similar views as this mother feel that learning Castilian is important because it is spoken in the rest of Spain and without knowing the language children will be at a disadvantage and therefore limited in terms of job options in the future. Often times these individuals in Catalonia are referred to as “españolistas” (Balsells, 2011). Others who take this side of the Catalonian identity conflict do not support that fact that in Catalonia, linguistic maps of Europe’s are available in French, German, and Catalan but they are not available in Castilian (Rees, 1996). They argue that this is another example of the way in which Catalan’s linguistic representation is not fairly recognized. These few examples reflect how prevalent this identity conflict is in virtually every aspect of life in Catalonia ranging from the education system to the national currency, to the language used on maps. This conflict is something that not only impacts the people living in Catalonia but also the entire country as a whole. Regardless of whether one chooses to take a side, the tension of the Catalonian identity conflict is inevitably felt and has been for many years and probably will be for many more years to come. Gruyter, Mouton. (2008). Multilingual Europe: Facts and policies. Berlin,KG: Walter de Gruyter GmbH & Co.
Vila I Moreno, F. Xavier. (2008). 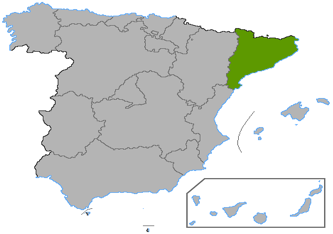 Catalan in Spain. Multilingual Europe: Facts and Policies, p 157-183.